Cool and menthol sensitive receptor TRPM8 belongs to the group of thermoregulation receptors which affects pain sensation and signaling. Menthol decreases the skin temperature which activates the TRPM8 receptor. 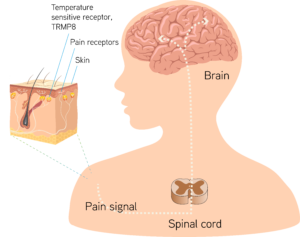 TRPM8 receptors covers 15 % of all pain sensitive receptors. Pain and temperature information is transmitted to the central nervous system, spinal cord and brain via small nerve fibres. For example, tissue damage activates the nociceptors to send signals by peripheral nerves through the spinal cord to the brain. Ice Power Cold Gel decreases the skin temperature which activates the thermoreceptors (TRPM8 reseptors) to transmit the sensation of cold via the same nerve fibers as the nociceptors bring pain signals. After the afferent information has been processed in the spinal cord and in the brain, pain becomes more controlled.